The biggest equines in the world are the draft breeds. These horses were bred to pull or carry large loads. 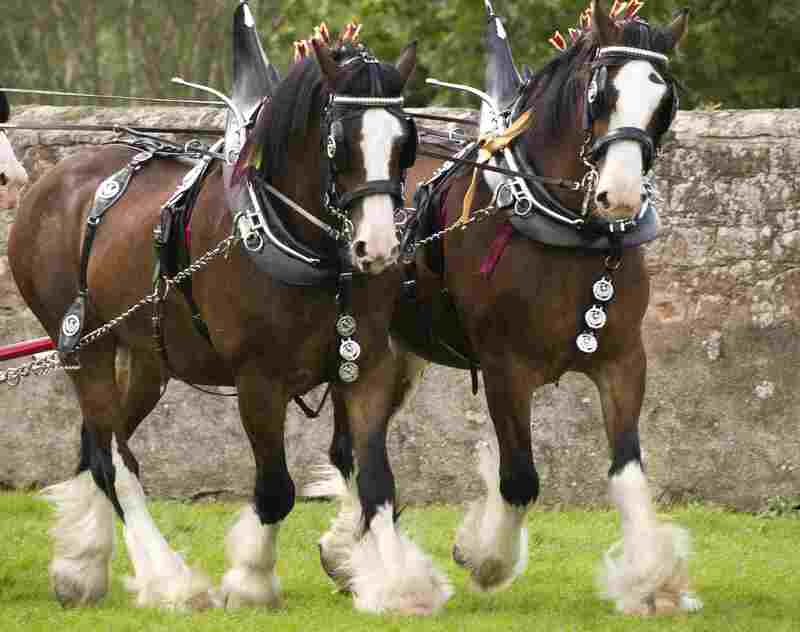 Included in the draft breeds are the Shire, Percheron, and Clydesdale horses. Before the use of trucks and tractors, draft horses pulled plows, wagons, streetcars, barges, and other farm implements and conveyances. They were also used by militaries to carry soldiers and supplies and to pull equipment and weapons. They are still used in some parts of the world for farm work, notably in North America within Mennonite and Amish communities. And they are better for the environment for small logging operations. Draft horses are the gentle giants of the horse world. They are known as “coldbloods” who have docile, stoic temperaments. Today, they are popular with those who enjoy driving, competing in heavy horse pulls, and those who want large but dependable, quiet riding horses. The smallest horses in the world are ponies. There are several breeds specifically developed for their diminutive size such as the Miniature Horse and Fallabella. Ponies are very hardy, and they tend to live longer than their larger relatives. For their size, they are very strong and, historically, even ponies like the small Shetland were used as pack and draught animals. Ponies are enjoyed by children and are often their first experience in riding a horse. They are very smart but are prone to obesity and problems like laminitis. The Shire horse breed is known to be very tall with the average height being 17.1 HH, according to the American Shire Horse Association. But other breeds like Belgians and Clydesdales have also been height record-breakers. Horses are not measured in inches, but instead designated as "hands high." To calculate this, you take the measurement of the horse in inches and divide by 4. The decimal represents the additional inches, not a fraction. Thus, the average height of the Shire horse breed is 69 inches, almost 6 feet tall. 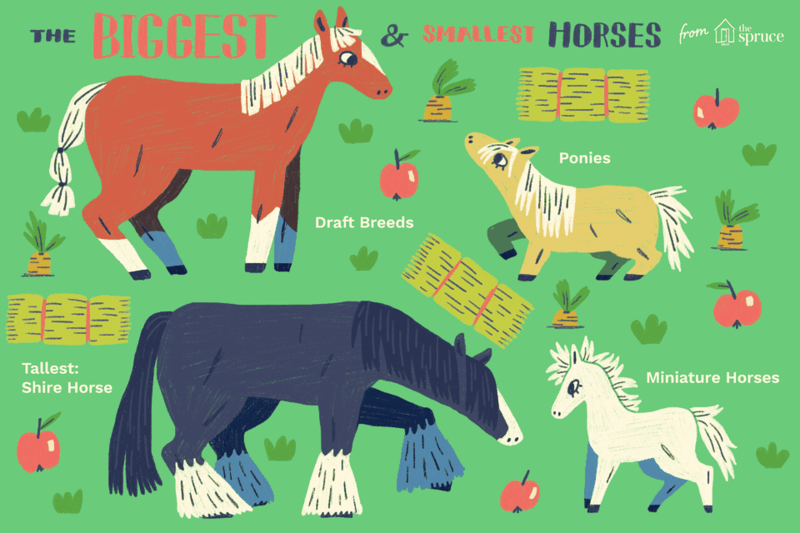 The tiniest breeds include the Falabella and the Miniature Horse. Falabellas average 25 to 34 inches at the withers (the highest part of the horse's back). However, there is no breed standard for height. Miniature Horses are divided into height divisions with the tallest being no more than 38 inches at the withers. Unlike regular horses, these are not measured in hands, but in inches or centimeters. Many Miniature Horses are distinctly pony-like in build, while others are more refined, like little horses. Minis and Falabellas are often too tiny to be ridden, but they are driven (pulling a cart) and enthusiasts use Miniature Horses to compete in obstacle courses and jumping in-hand. The Guinness Book of World Records lists Sampson, a Shire gelding born in 1846, that stood 21.2 1/2 hands (or 86 1.2 inches tall), as the tallest horse ever. Over the years, however, many draft horses have held the record for the tallest horse in the world. The current Guinness World-Record holder as of 2017 is Big Jake, a nine-year-old Belgian gelding, who measured 20 hands 2.75 in (82.75 inches, 210.19 cm) unshod (without shoes). The smallest equine individual is a Miniature Horse. Thumbelina is the current holder of the smallest equine in the world record. She was foaled in 2006 and is 17.5 inches (44.5 cm) at the withers. Thumbelina shows the features of dwarfism in animals. Although Thumbelina is a healthy individual, dwarfism in ponies can include debilitating dysmorphic features such as poorly conformed, abnormally short legs, large joints, deformed heads and jaws, short necks, large barrels, and defects of the internal organs. Therefore, breeding dwarf ponies is frowned upon. A few others such as Einstien, Charly, Microdave, and Bitty Hope have vied with Thumbelina for the title of the smallest horse. Charly, in fact, is listed as the Guinness Book record holder for the smallest male horse. The smallest foal at birth is a Miniature Horse named Einstein, who at foaling weighed 6 pounds and measured 14 inches at the withers. He vies with Thumbelina for the smallest living horse because he does not show any signs of dwarfism. Einstein's sire and dam (father and mother) are champion Miniature Horses. He has been featured in publications like People and USA Today and made appearances in many television shows such as Oprah Winfrey, Good Morning America, and The View.